Wow. Nicely done, Stanley. Here’s your thirty pieces of silver. 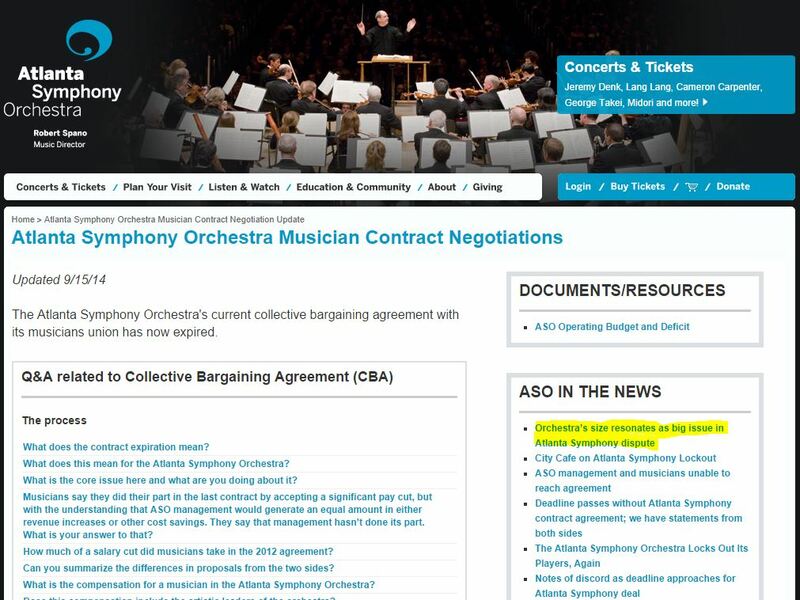 What makes me sad…well, one of the many saddening elements of the ASO Lockout is that there must be many generous members of the less-powerful but honorable and supportive ASO board who disagree with this slash-and-burn approach. It must hurt a lot to know that their opinion, perhaps, hasn’t been wanted all that much, and after all – it’s up to anyone to decide what “World Class” means, right? Can it also be up to anyone to decide what a CEO should be? I suppose I’m late in this suggestion, but have you checked into Romanstein’s tenure when he was President and CEO of the Minnesota Humanities Center in St. Paul, from 2001-2010? Speaking of the Woodruff Arts Center — I remember when Kenny Leon was running the Alliance theater that he had major issues with either the support, direction, finances, etc of the Alliance and the Woodruff that led to his departure. Does anyone remember any details from then? Was Kenny Leon’s departure an indication of the mismanagement and lazy fundraising o n the part of the board of the Woodruff? Also, the Symphony is a major enticement in wooing major corporations, businesses, etc. to Atlanta and the state. It is disturbing that the Mayor as well as the Governor are silent on the lockout. The mayor came out this week “broadcasting” that he is involved in keeping the Hawks in Atlanta ( after he lost the Braves), and the Governor is touting his jobs success in his reelection ads-yet, losing the Symphony will be one less “plum” he could dangle in front of investors to the city/state. Yet, neither seem to care about our major arts institution. Isn’t the arts that occur in that block one of the reasons for the huge redevelopment success of Midtown? People bought their condos so they would be in walking distance of the arts and entertainment. What will they walk to now — the Varsity? Ahhhh for the good old days when 1 administrative position ‘ s salary could buy an entire viola section. What is going on down there folks? Do we have to Gen. Sherman down for another visit? Despicable. I had a voice in the back of my mind while I was reading the last 990s, saying, “Yes, Eric, but this was all BEFORE the lockout. Surely they didn’t do anything so stupid DURING the lockout.” Now I know. I wish I could be there in the hall, when the orchestra comes back, to shout “Fire Romanstein!” Classical music isn’t dead or even dying. It’s being mugged. This is the story of a talented and promising child from a loving and supportive family. This child worked very hard, excelled at school, went off to a prestigious university and, through continued display of brilliance and talent, earned the attention and respect of important people in many different places. This child earned an impressive amount of accolades and demonstrated talent far beyond her years. She regularly went out into the world and expressed and conducted herself with remarkable maturity around seasoned, venerable adults. Instead of moving out on her own and starting the adult life and bright future that everyone expected, this now-adult child has had to continue living with parents who no longer show the same kind of love and support– they appropriate their child’s earnings and use them in opaque ways to manage household expenses, and they won’t let the child take jobs befitting her talent, go out to dinner, date or get married. Now they’ve even kicked the child out of the house, claiming the child is a needy dependent who is losing them money! Would anyone out there with scruples or a solid concept of social or moral decency think this is OK? Of course not! I am convinced more and more that failure is the goal here, which is simply unfathomable to me– why pass up the opportunity to be the broad-minded and courageous (to use Romanstein’s own word) ASO/WAC directors who successfully transitioned the ASO out from the WAC, who let your now-grown child, ready to start adult life with sterling accolades under her belt and a dazzling future ahead, move on and be independent? And if you’re keeping the ASO caged up under the WAC for the income that comes from its donor base, why do you want to take hammer-swinging approaches to re-engineering that product and drive away your donors? Sounds like Hepner has brought herself and her resume into a position where it simply doesn’t belong– downsizing doesn’t work the same in an orchestra as it does in a corporate environment– and shame on Atlanta’s business and civic leaders making up the WAC board for buying into it. Interesting anology jmann. Not sure I follow it. I tend to see things in shades of grey, so maybe that’s why? Speaking of which, shades of grey that is – and since I go through phases of being more a visual thinker from time to time – have you seen Lord of the Rings movies, by chance? The reason I say that is because there is a scene, a rather good scene, adequately written and wonderfully acted out and filmed, which portrays a king struggling with a conniving yet convincing influence peddler. If you can imagine. Well, if you go one step further, imagine Atlanta Orchestra management and their PR monkeys as the character Grima Wormtongue (Tolkien had a way with names, heh) and the king as those responsible for keeping AOS vibrant, healthy, and engaging (read not management in its current iteration) perhaps a slightly different understanding will present itself as you watch Gandalf the Grey get a handle on things? I’ve enjoyed your work and fully support the ASO musicians. But as someone with a PhD myself, I wish you would stop using Dr. Romanstein’s degree in what I perceive as a pejorative sense. To my eyes, your emphasis on the degree suggests we ought to be suspicious of those with advanced degrees, or that it makes him less trustworthy. I think that’s a cheap and unnecessary shot. In any case, it’s PhD (or Ph.D.), not PHD. Fair enough. Thanks for the comment. No we ought not to be suspicious of those with advanced degrees (otherwise, *I’m* dreaming of becoming suspicious someday, because even as the likelihood gets less likely each year, I still dream of earning one; and a variety of important lynchpins of Save Our Symphony Minnesota would have to be filed under the suspicious category, too; they’re a well-educated bunch). I’ve talked to quite a few people with PhDs during the Atlanta debacle who have said they would NEVER use Dr. Romanstein’s titles in the way he often does, especially since his PhD is in musicology and therefore completely irrelevant to the leading of a symphony orchestra. (We could probably have an interesting conversation about this, but as one musicology PhD who I talked with said, “A degree in musicology makes you LESS qualified to run a symphony!” As an aspiring musicology PhD myself, I think she’s probably right.) It would be one thing if he was teaching, or had a doctorate in arts management, but…he’s not, and he doesn’t. With Romanstein, I really do feel that every time he alludes to his musicology PhD, he is also advertising his professional under-qualification to run a symphony orchestra of this size. But, as with all horribly horribly frustrated snark, your mileage may vary. And if it bothers people I can ratchet it down. God only knows there’s enough to criticize without prodding at his penchant for advertising relatively irrelevant degrees. I believe his credentials are being mocked because of the irony of the situation: here’s a man who probably is NOT qualified to run an orchestra, unless it be into the ground. Emily, could you look into questioning the IRS about the WAC’s nonprofit status? I’m out of date, but last I researched this, they were looking into extreme nonprofit executive salaries, and possibly revoking 501c3 status thereby. Last I wrote about this, most nonprofit execs earned under $100K, but the abuses were in arts organizations, health care orgs, and university endowments. So the salaries zoom from about $60K directly to $500K+, with almost nothing in between. If they can pay these salaries, there’s no reason the organization should be nonprofit. Another hilarious exercise is looking at the “mission statement” on the 990. It usually involves bringing culture to foreign countries, which apparently taxpayers are supposed to support. Good job on your blog! Strangely enough, tickets are for sale on the ASO website for September concerts. I’ve sent an e-mail asking about it; I’ll be sure to let you know when I hear back. Romanstein’s salary reflects (bonus and all) a 3% decrease from the previous fiscal year. Robert Spano’s salary reflects a 19% increase from the previous fiscal year (if you’re doing the math, yes, that is more than $130,000). Say what you want about the artistic value of Robert Spano, the fact remains that during the first lockout year, Romanstein took a pay cut and Spano took an extra $130,353. Meanwhile, players accepted a 14% decrease in salary. Let’s face it, if your concerns lie with inequality within the organization, Robert Spano simply cannot be immune to scrutiny. If the answer is that all Music Directors make that kind of money or more (which is true) then maybe it’s time for orchestras to reevaluate. That’s a fair assessment. As I say elsewhere on this blog, your mileage may vary. And yet… my primary concern actually ISN’T equality within the organization. It’s more about what they’re getting for their money. I think they’re getting a lot better return from the Spano investment than the Romanstein investment. Just as I think the Minnesota Orchestra got a better return from the Vanska investment than their Henson investment. Here’s a situation I know much more about, having stewed in it for two years… Osmo Vanska takes home somewhere around $850k a year (he took a 15% cut when he returned this summer). The Minnesota musicians’ base pay is about $96k, which only comes AFTER a sixteen month lockout. Robert Spano takes home around $689k a year; Atlanta musicians’ base pay has been around $74k recently. So Minnesota’s music director is paid roughly 8.6x the musician base salary; Atlanta’s music director is paid roughly 9.3x the musician base salary. So the inequality is at a fairly similar rate in both organizations. But do I think Osmo Vanska is overpaid? Hell, no; he’s worth every penny. And I think most Minnesotans would agree with me. If that’s what we have to pay to keep another orchestra from gobbling him up, then I say, let’s pay him that. There is nobody else on the face of the earth that could do the job that Osmo is doing right now in Minnesota. That sounds overly dramatic but it’s true. So I’m not sure how I can square my support for Osmo’s salary while condemning Spano’s. I guess the answer doesn’t lie with me; it lies with the community of Atlanta. Do y’all think he’s as important to your organization as Osmo is to ours? I don’t know what opinions are; I’m not on the ground in Atlanta. I maintain that these are complicated questions. I’m not saying music directors aren’t overpaid. (I’m also not saying music directors ARE overpaid…) The situation likely varies from city to city. I’m also not sure what a realistic equitable fix to the problem would look like, if there is a problem. Complicated thoughts, maybe, but at least they’re honest. I might change my mind later. Thanks for commenting. I sort of feel bad for the guy… his email inbox must be swamped. So yes, the ASO Questions email was indeed a false storefront!